I've been a professional cartoonist since 1989. This crazy unplanned career started with visual training and a degree in photography. While pursuing a second degree in Political Science and doodling in class, my caricatures were discovered. The career jumped from the college newspaper at The University of North Carolina at Charlotte ...to national awards ...to local media ...and then to the advertising world. This career took a turn towards the comic book world with the birth of my dog-son Rooter. A series of comic books were distributed internationally, He and I traveled around the country to comic-cons and book signings, appeared in newspapers and on television. "We" recieved fan mail and e-mails from all over the county. My little buddy died July 25, 2004. He taught many of us about true friendship and pure love. 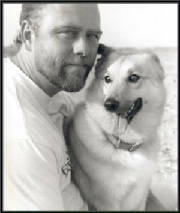 He was a big inspiration for a little, 40-pound dog and he really helped me set my career in motion. My cartoons and illustrations are now available for advertising, book illustrations and specialty products. Like the man said, "Do what you love, the money will follow."